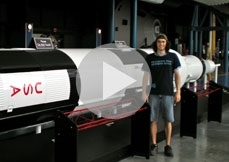 Cameron Mercer talks about his internship at NASA. Who am I? How should we live? What can we know? What can I hope for? As senior Alexa Warburton opens the door to the cephalopod lab, a pungent smell escapes into the third-floor hallway of Middlebury College’s McCardell Bicentennial Hall. “It smells like the ocean,” she comments. And it should. Warburton, a senior biology major from Hopkinton, N.H., is spending her summer studying a member of the cephalopod family, Octopus bimaculoides . Her goal is to study the way these saltwater creatures learn, thereby furthering the already-extensive body of research on invertebrate intelligence. Middlebury College has named Associate Professor of Geology David P. West as the recipient of the 2009 Perkins Award for Excellence in Teaching. West, a field geologist whose students have commended him for being “a master at explaining concepts” and “incredibly organized and effective,” will be honored at a reception open to the college community on Tuesday, March 17, at 4:30 p.m. in Room 104 of McCardell Bicentennial Hall.